In Southern California, where I live, I have to search long and hard to find some fall color. I drove all over town today looking for a place to do a photo shoot. But then I saw this ivy on the wall in our backyard and just took some photos here. There are a lot of photos because I couldn't decide which ones to share and also the colors of the quilt just looked so pretty with the colors of fall in Yorba Linda. This giant star quilt made with Pat Bravo's Indie fabrics has been screaming at me to be finished for nearly a year. I think I pieced the two star quilts at the end of 2012, put them on my Finish-A-Long list in April and finally finished one this summer, donated it to Oklahoma Tornado Relief, and now I can say the other is *D*O*N*E* too. 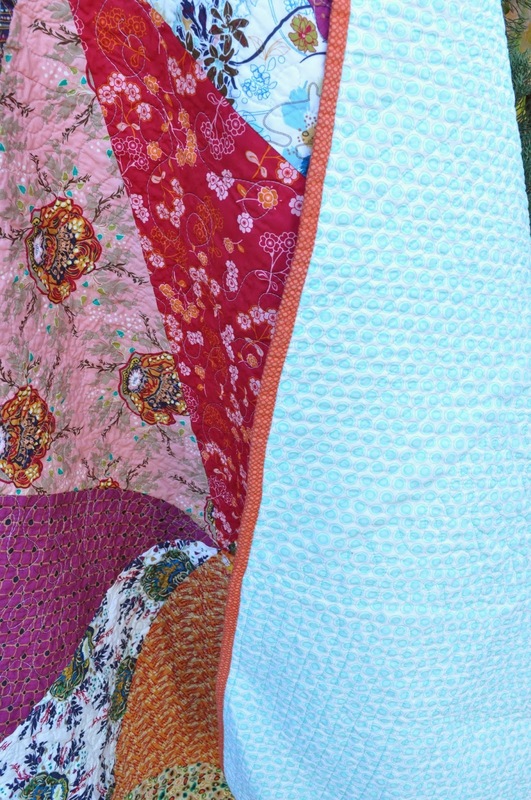 This pattern by Jeni Baker is really easy and it yields two quilts, made from 16 fat quarters. For this one I used Essex Linen in Steel Grey as the background. The grey really shows off the colors of the Indie prints so well. Quilted with a loopy squiggle in each printed triangle piece and with straight-ish organic lines on the linen helps to make this a comfy and cozy quilt. I will be giving it to a friend who had her 60th birthday last week. We need to book a date to celebrate; with a new granddaughter and the death of her dad all happening around her birthday, we have yet to celebrate. Very nice quilt and I love the combo of fabrics! Your pictures are beautiful and the quilt is too. I love the quilting and it will be a wonderful quilt for your friend. I have to admit I assumed that it never really was fall or winter at your house, your pictures tell me otherwise. Beautiful quilt and quilting! The pictures you took of the quilt were beautiful too. 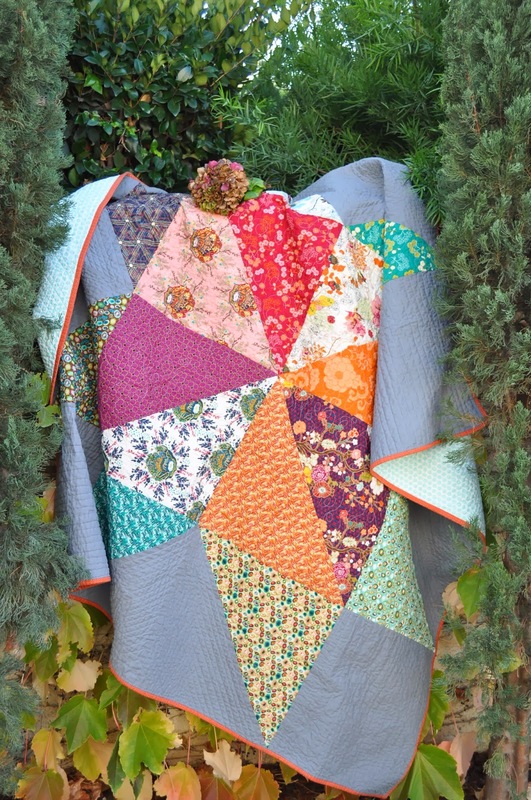 A lovely quilt Di. I have a bundle of Indi that I keep cutting into and now there's not enough to do anything special with it. I never imagined you had an autumn (fall) in CA either! 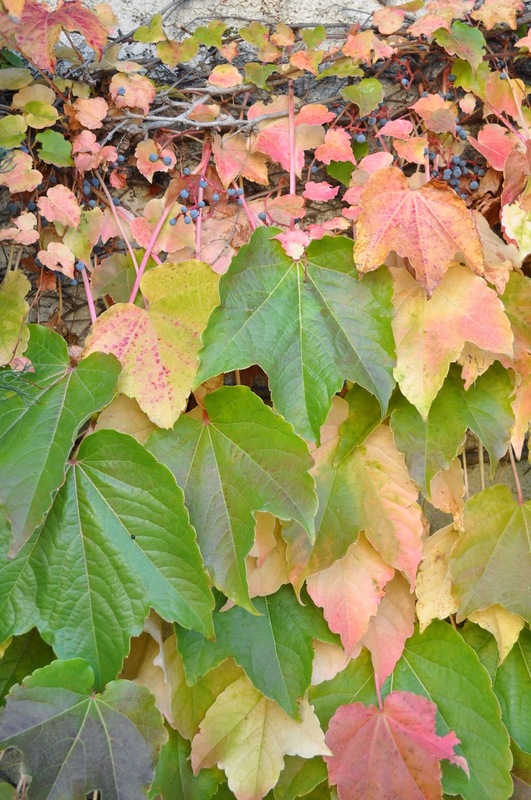 What a perfectly fine Autumn you are having...those leaves and Hydrangea are beautiful! And the ideal backdrop for your lovely quilt! What a special gift! Loved the Giant Star you donated to the OK Tornado relief and love this one too! Great job! And your fall pics are beautiful! Very pretty quilt! The gray really makes the star pop! Great pictures and a beautiful quilt! That's a lovely birthday gift! Absolutely gorgeous! I love your photo shoot! Yay for finishes, love it! Such a beautiful quilt - love your photos too! It's perfect for fall...I loved those fabrics but never got my hands on them :( It's a beautiful finish and your friend is sure to love it. Awesome photo shoot :) That last photo is just amazing. 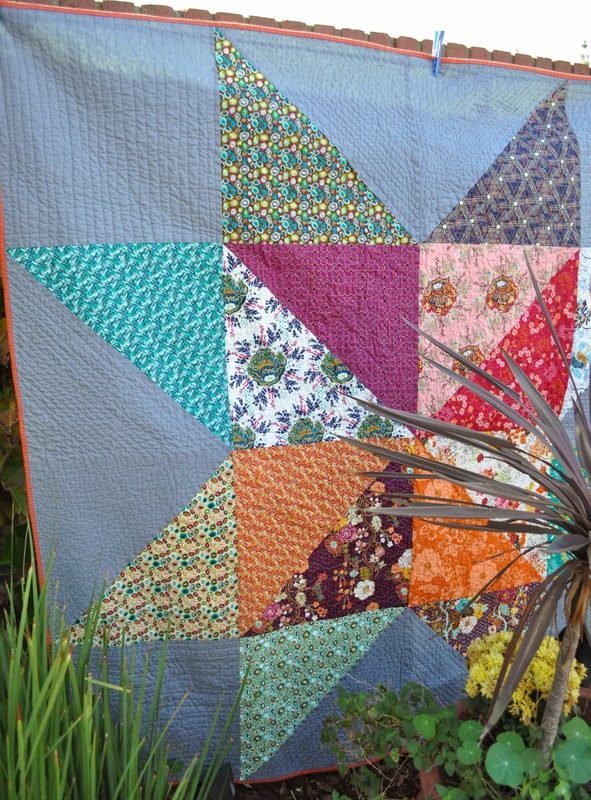 Your quilt is simply gorgeous - fab combo of a great pattern with lovely fabric.